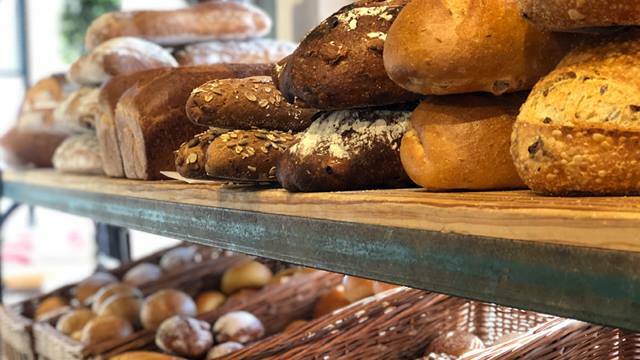 Joe Leone's Gastronomia, Sea Girt : It's all about the bread! Joe Leone's Gastronomia - It's all about the bread! It's all about the bread! The glassed-out centerpiece of the original retail store, the bakery produced fresh loaves, rolls and stuffed breads throughout the course of the each day, often serving warm batches to customers as they witnessed them coming out of the oven. Originally limited to White Italian and Semolina styles and a production of approximately 100-150 pieces per day, Joe Leone’s Bakery has expanded and modified operations over time to include multiple dough styles, bread styles, stuffed breads and now produces thousands of pieces per day to supply both retail locations, a catering operation and a handful of local, small volume wholesale accounts. Joe Leone’s Bakery also has developed a Sweets program to complement the bread offerings featuring Pignoli Cookies and a variety of styles of other cookies, pastries and traditional specialty items such as St. Joseph Pastries (March), Wheat Pies and Ricotta Pies (Christmas & Easter). Click here to see Joe Leone's Bread of the Day! Joe Leone’s Gastronomia is a satellite location of our flagship store. A condensed version of Joe Leone’s Italian Specialties, driven by the same vision of culinary excellence & committed to quality customer service. Joe Leone’s Gastronomia is a source for traditional Italian specialty items, homemade breads, handmade fresh mozzarella, restaurant quality prepared dishes, all produced fresh daily, along with a limited selection of both imported & domestic cheeses & unique retail products. Built for convenience, Joe Leone’s Gastronomia offers a variety of choose & go sandwiches, salads, soups, sauces, dips, cheese & desserts for entertaining guests. Custom Gift Baskets, Handcrafted Gift Boxes and Gift cards are also available. Committed to quality, personalized customer service & overall Excellence for almost 10 years, Joe Leone’s Gastronomia has earned a comparable reputation to our Point Beach store.